Use XForms to create a standard survey using OpenDataKit. The OpenStreetMap question launches the OMK app to enable OpenStreetMap editing. Take your survey to the field to collect data and geographic information. 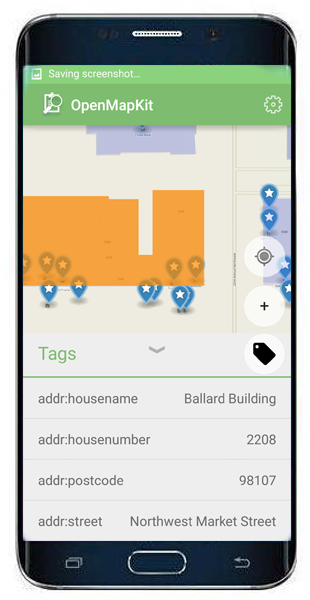 OpenMapKit (OMK) is an extension of OpenDataKit allowing users to create professional quality mobile data collection surveys for field data collection. OpenMapKit launches directly from OpenDataKit when the OSM question type is enabled in a standard survey. Simply include OSM questions and tags in your survey to collect information on OSM in the field. Traditional field data collection tools for OpenStreetMap have either relied on paper or are too complicated, targeted at GIS professionals, or lack an understanding of traditional survey techniques. As new projects such as Missing Maps and other humanitarian field data collection projects focus on field data collection the need for a structured, yet simple, OpenStreetMap field data collection tool became apparent. OpenMapKit serves this need. Include standard OpenStreetMap tags in your survey. Create new Points of Interest and load those into OpenStreetMap. Simply drop a pin to create a POI and add tags. Securely collect your survey results in OpenMapKit Server. Save your edits and upload your public data to OpenStreetMap.